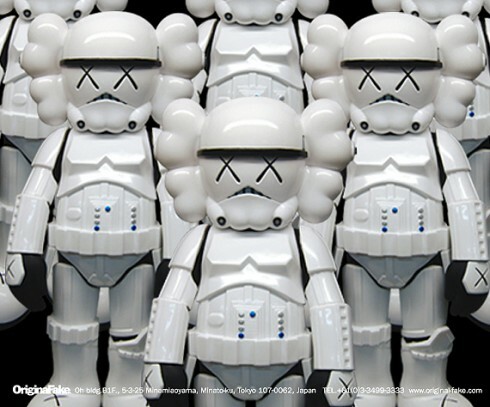 To antic­pate the bed­lam this Sat­ur­day, Sep­tem­ber 27th on the release of KAWS’ Storm Troop­er fig­ure. The Orig­i­nal Fake flag­ship in Aoya­ma dis­trict of Tokyo pub­lished a guide­line to keep the event order­ly. Pur­chas­er must be 15 years old or old­er, and must be able to present a valid iden­ti­fi­ca­tion at the event. A lot­tery sys­tem will be imple­ment­ed start­ing 9 am. This will only give cus­tomer a fair chance to enter the store. But the figure’s avail­abil­i­ty will still be on a first-come, first-serve basis. Rumor has it fans are already lin­ing up around the store front. Geez. These will be gone quick.